9th June: Brimstone moth Opisthograptis luteolat) emerged in our Pershore garden. 16th June: Blackbirds catching Garden Chafers Phyllopertha horticola on the wing in our Pershore garden. 19th June: Hummingbird Hawkmoth Macroglossum stellatarum attracted to Honeysuckle hedge at 21.10 hrs in our Pershore garden. 27th June: Pied Wagtails fledged from a neglected window box on a first storey ledge in Pershore High Street. 28th June: Four Turtle Doves were perched together on a telegraph wire at a traditional site off Childswickham Road, Broadway. 9th July: Goldcrest nest blown down from a tall pine tree next to Pershore Abbey during a gale. It measured 3 inches in diameter and was made of small white feathers and grass. 9th July: Fish Hill roadside verges at Broadway included Common Spotted Orchids (going over), Pyramidal Orchids (abundant) and six Bee Orchids (a poor year). 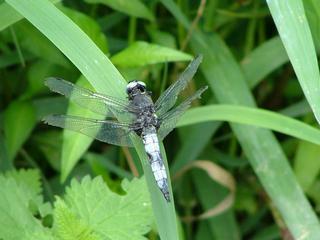 13th July: Male Emperor dragonfly Anax imperator was a new record at Broadway Gravel Pit Local Nature Reserve. 13th July: Garden Tiger moth Arctia caja. A new record at Broadway Gravel Pit Local Nature Reserve. 25th July: Male Emperor still patrolling at Broadway Gravel Pit Local Nature Reserve, also a female Brown Hawker Aeshna grandis, a new record at Broadway Gravel Pit Local Nature Reserve, observed to be ovipositting. 25th July: Painted Lady Cynthia cardui on Crocosmia flower after 21.00 hrs in our Pershore garden. 3rd August: At least two males of the Scarce Chaser dragonfly Libellula fulva often perched openly on riverside vegetation beside River Avon near the railway along from Eckington Bridge. 8th August: Juvenile Grey Heron at Broadway Gravel Pit Local Nature Reserve expertly picked off male Ruddy Darter dragonflies Sympetrum sanguineum whilst standing at the edge of the pool in front of the hide. 28th August: Male Orange Swift moth Hepialus sylvina released from our Pershore garden conservatory. 30th August: Two Hummingbird Hawkmoths feeding at Verbena bonariensis and Buddliea during the evening in our Pershore garden. 6th September: Larva of Buff Tip moth Phalera bucephal) appeared in our Pershore garden. 8th/13th September: Hummingbird Hawkmoth again at Verbena bonariensis in our Pershore garden. 10th September: Female Lesser Yellow Underwing moth Noctua come) caught and released into our Pershore garden. 24th September: Treble-Bar moth Aplocera plagiata plagiata. Rescued from the road in Kemerton after being hit by a passing car and subsequently identified as a second generation male (pointed abdomen). The Treble-Bar is a distinctive and common triangular shaped moth. 30th September: Ten Common Buzzards grouped over Bredon Hill, Kemerton. 1st October: Red Kite over Bredon Hill, Kemerton. 7th October: Ten Common Buzzards and adult Peregrine over Kemerton. 29th October: Clouded Yellow Colias croceus flying across arable field at Kemerton. 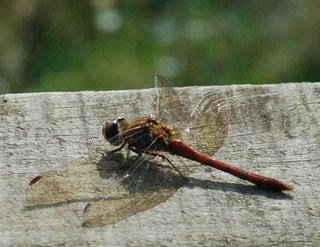 9th November: Many Common Darter Sympetrum striolatum observed at Kemerton Lake, some in tandem. 20th November: Peacock Inachis io sunning on a wall, Broadway Village Centre. 26th November: Red Admiral (Vanessa atalanta) sunning on a fence panel at Kemerton. 22nd December: Two Wood Pigeons on telegraph wire over our Kemerton garden at 09.00 hrs were engaged in a courtship ritual followed by mating. This was followed by mutual preening of each other’s head and neck. 28th December: An unusual Ladybird found inside our main bedroom window at Kemerton measured 8 mm long, was black with four red spots (the two front ones being larger) and two large white spots on the thorax. On the underside was a red horseshoe border at the tail end. Sadly I lost the specimen but was able to identify it as the spectabilis form of Harlequin Ladybird from the Harlequin Survey website.